I love a good smoothie any time of year, because they are so simple to make and easy on the go! I do also love to eat seasonally. This smoothie combined all the flavors of fall that I was craving one chilly morning, and it hit the spot after a good morning workout! Swirl some yogurt and/or chocolate into to the smoothie for a little something extra. 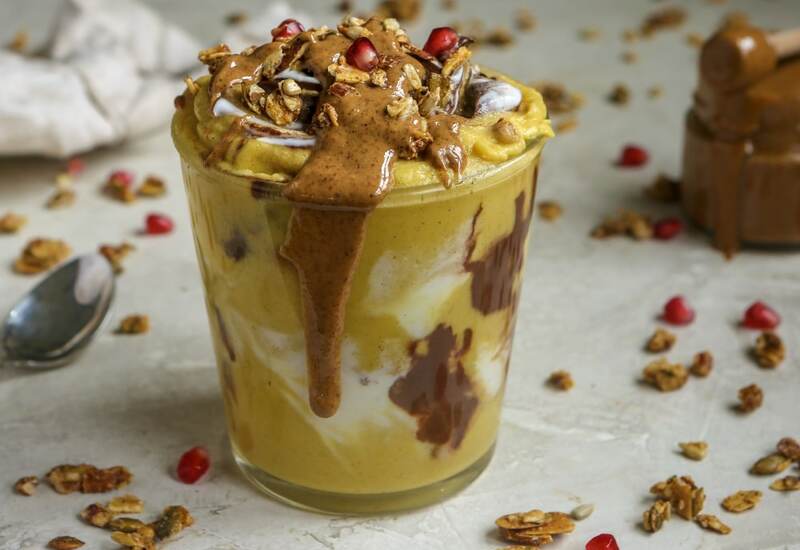 Top with granola, almond butter, and pomegranate seeds if you wish! Substitute the almond milk with coconut or other non-dairy milk. Add ½ teaspoon turmeric for an extra immunity boost! If you aren't vegan, substitute collagen peptides for the protein powder for a different form of protein. Per Serving: 236 calories; 4g fat; 23.5g carbohydrates; 29g protein; 5mg cholesterol; 74mg sodium. I doubled this recipe to make two batches for me and my wife. We don't have a standard blender at home, but the immersion blender worked very well. Only substation we made was using whole milk instead of almond milk.